Widen KY 237 (North Bend Road) and increase capacity at the two roundabouts at Graves Road and Cardinal Way to reduce congestion. The two roundabouts on KY 237 (North Bend Road) at Graves Road and Cardinal Way will be widened to accommodate future traffic volumes and reduce congestion. Congestion related crashes are expected to decrease as a result of this project. The proposed project will complete a widened route from the I-275 interchange with Graves Road to the commercial and industrial development along KY 237 near the existing I-275 interchange. Alternative analysis will be important to examine the expected impacts to the volume and distribution of traffic at the roundabouts from the proposed Graves Road interchange. Two-lane roundabouts are typically less pedestrian friendly than one-lane roundabouts. Alternatives should include provisions to safely accommodate pedestrians. The project will require a strong public involvement component to educate the community on navigating a one-lane roundabout as compared to a two-lane roundabout. Existing KY 237 in the Hebron area is severely congested. The future interchange at Graves Road in combination with planned residential and industrial development is expected to increase the amount of traffic and the proportion of trucks on KY 237, including the Graves Road and KY 2846 intersections. After construction of the Graves Road interchange, the approach volume distribution at the KY 237 and Graves Road roundabout is expected to change. KY 237 to the south of this project primarily serves a mix of multi-family housing, commercial and industrial land uses, as well as a connection to the I-275 interchange. KY 237 to the north of this project primarily serves residential land uses. By the year 2040, over 3,000 new jobs are expected in the Hebron Area. In the Hebron Area, population is expected to grow by over 12,000 homes by the year 2040. The frequency of crashes along KY 237 within the project limits is approximately 60 percent higher than the statewide average for similar roadways. 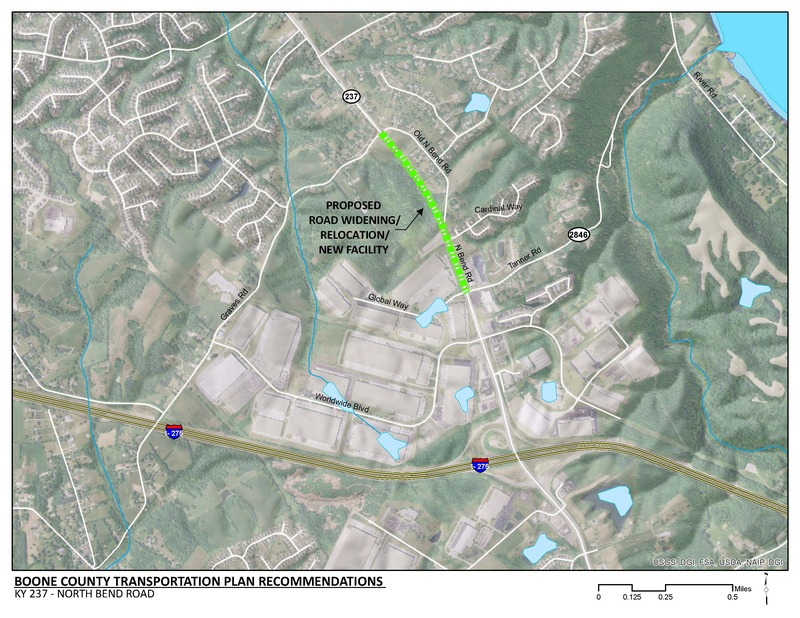 There are existing multi-use paths along both sides of KY 237 that should be re-installed with the widening project. There is a TANK Park & Ride lot located in the north-west quadrant of the KY 237 and Cardinal Way roundabout.